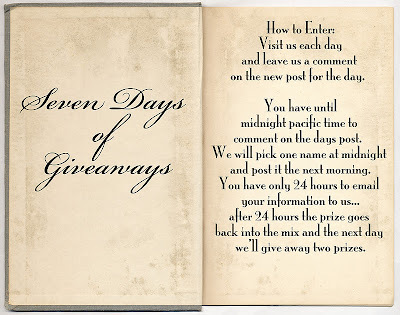 Welcome to the 7 days of Giveaways! We don't really talk about ourselves much on this blog (and that is by design) but today I thought we could start out our 7 Days talking about Tradition. I hope by posting a Christmas tradition we have in our family that it will cause you to think about traditions in your own family. I am guessing...as with many of you one of our favorite traditions involves food. My mother was Portuguese (Azores) and these enchiladas were tradition in my family. We learned to make them as children because as you will soon see, the recipe calls for many hands to help. We continue to make and eat these each Christmas Eve. I know the recipe might seem odd...hard boiled eggs in enchiladas? but I can attest to the fact that an entire tray of them will be devoured that evening (we always make 2 trays because they are even better the next day). So even though this might not seem like a holiday meal...it means something special to our family. This is my mothers recipe, the one she used to teach me and the same one I have used to younger family members. It is stained and there are words spelled wrong (typical for our family) but it is in her handwriting which makes it all the better. We have tweaked the recipe over the years but just slightly... by adding more cheese to the mix and I always seem to need more eggs for the top so I just boil a dozen to be safe. You can always add sliced olives instead of whole. My dad did not like olives so my mother always used whole so they would be easy for him to pick out. She loved him like that. I thought I might share some candid shots of the youngest family members making the enchiladas. These photos were taken last Christmas Eve to document the process. The kids know the recipe and their specific job because they have been taught by their mother, my niece Courtney, who was taught by my mother as a young child. Everybody is at their station and ready to start! Britney dips the tortilla in Wesson oil, then drains off the excess. Across the table, Courtney adds the filling to the enchilada then it moves it on to the cheese station. As I look at this picture I am wondering what in the heck is all the stuff on my kitchen counter? Looks like an episode of Hoarders. 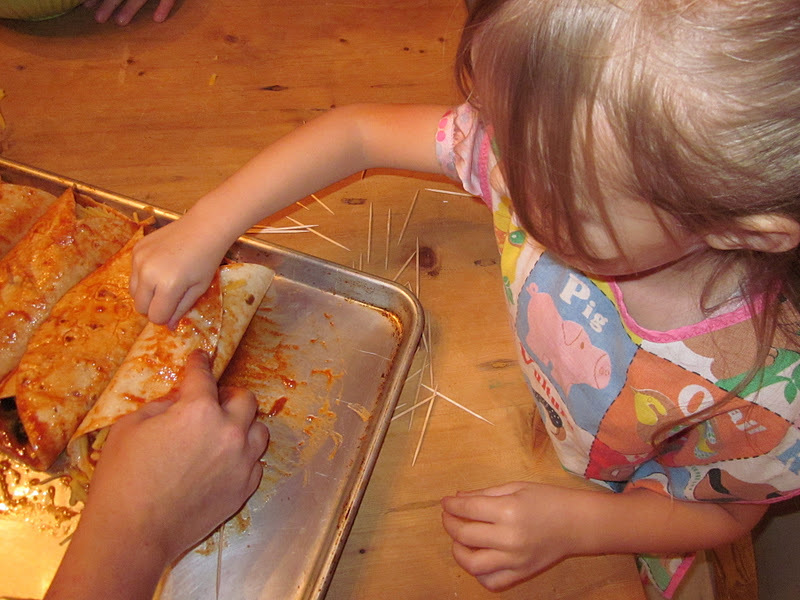 Courtney rolls it up and holds while Ellie adds two toothpicks (always 2), one on each end. Ellie is only 3 but she takes her toothpick job very seriously. Add a bit more Las Palmas to the top before adding the last of the cheese, eggs slices and olives. Here are the finished enchiladas waiting for to go into the oven. 350 degrees for 20-30 minutes. I hope this post has you thinking about your traditions. How about some journaling prompts? What Holiday traditions do you have in your family? Which traditions are the most important? why? What is the longest running tradition? What is your favorite tradition you had as a child? Use these prompts to journal about your family traditions, make a scrapbook page, or just write the story down for later generations. If you participate in a Holiday dinner it might be fun to give each person a 4 x 6" card to write down their favorite tradition, then share it with the group. It's all about keeping the traditions going so we remain connected to our past, then sharing it with family or friends. 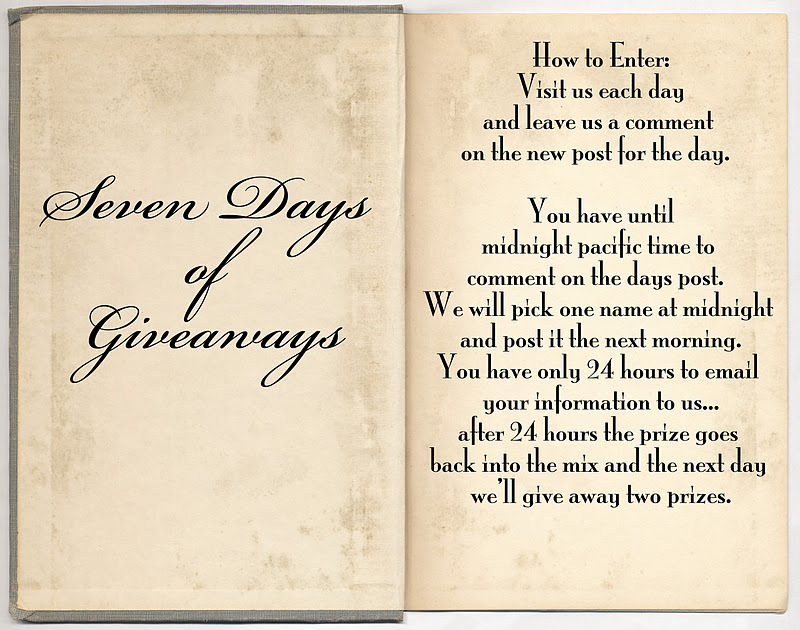 To enter today's Giveaway of a stash of 7gypsies products just leave us a comment. If you like, you can tell us about a tradition in your family and if you want to go a step further you can always send us an email with a story and photo if you have one. But remember to leave a comment first! Day 1 giveaway will close at midnight pacific time. Come back tomorrow for a new project tutorial and another chance to win! Handmade Christmas stockings on the fireplace. My Mom is Italian and every Christmas time we make homemade raviolis from a hand written recipe much like yours. I love that our family has carried on this tradition. They are soooo yummy and the whole family looks forward to eating them!! Christmas traditions are wonderful... most of all it is precious time spent with family. We are Italian and each year we would make Pizzelle's the smell of the anise reminds me of Christmas. I have continued this same tradition with my own children. 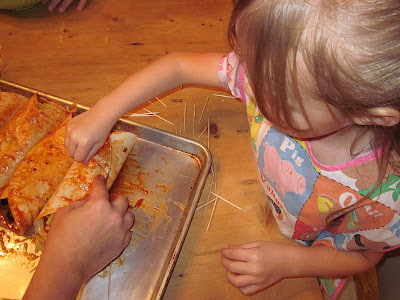 These enchiladas look like fun to make, especially for kids. Looking forward to the next six days. Our family tradition includes making gingerbread villages for now. My kids are still really little so I am excited to see what new traditions we can come up with. I love that you're are continuing the traditions in your house! Those enchiladas look mighty tasty!! I adore learning what other families make for Christmas Eve dinner. We have had different meals, but mostly lasagne. your enchiladas are really different and I will by trying them after the holidays! Merry Christmas. Oh MY! That looks YUMMY! We have always had the tradition of an ornament a year and now DD gets one two so that's two ornaments a year! Our newest tradition is Gingerbread house making! I love seeing the stains on your recipe cards. They so remind me of my mother’s that I have and will pass down to my daughter. We have always had a tradition of trying to guess 1 present. The giver gets to select which gift and the receiver gets 1 or 2 clues. If they guess right, they receive $5.00. If the giver feels very confident, they’re aloud to up the ante. okay, Shawn that is one I have never heard of! Love it and love the fact that you can up the ante...this could make for some "creative" gift giving! What a fun tradition! And it looks yummy! We don't have many traditions, but the one Christmas one we do have is to give each of the kids a new pair of PJs on Christmas Eve. They are excited to open one present before the big day (even though at this point, they know it's PJs), and I'm happy because in the Christmas morning photos, they aren't wearing ratty old pajama! :) Thanks for the chance! I am also of Portugese decent, all four of my grandparents were born in Portugal. As a family we still make the 7 fishes traditional Christmas Eve dinner. I do sneak in ravioli for my new son-in-law who doesn't eat fish!!!! Happy Holidays to everyone! My ethnic heritage is Italian and Polish so our family holiday celebrations are all about the food! We all seem to end up in the kitchen helping to make all of our traditional favorites and trying out the new recipes that we find each year. And just like your mother's timeworn enchildada recipe, we have several handwritten recipes from our Polish and Italian grandmothers that we pull out each year to read and enjoy (reading their handwritten notes is as much fun as enjoying their delicious dishes). One of our silly traditions for the holidays is that on Xmas eve, we all pile into the car with our coats on over our PJ's and drive around the neighbourhood admiring our neighbours' Xmas light displays. When we get home, we warm up with hot chocolate and nibble some holiday baking. Another that we have is on Boxing Day (Dec. 26th in Canada) we go through our closets and bag up any unneeded warm clothes, which we then deliver to the homeless shelters between Xmas and New Years. One year, it was very cold and there was a foot of sneaux on the ground (unusual for Vancouver) and there was a man waiting outside the shelter in FLIP FLOPS. Seeing that (which was heartbreaking) drove home the importance of this tradition. In a season of abundance, it's important to be mindful that not everyone is as fortunate and it's our responsibility to DO SOMETHING about it. Christmas food tradition in our house was always making huge batches of Chex Mix. We shot fireworks on Christmas Eve to help Santa find his way to our house. This started with my Grandfather. I love holiday traditions. Family and food is ours....I find myself missing some of the old favorites as we all age and do less each year. OH! 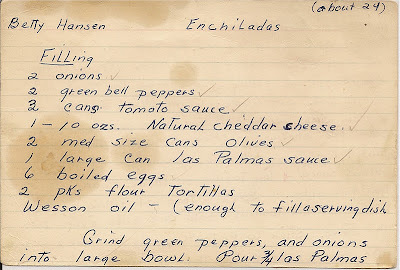 So excited to see the eggs in the enchiladas... my MIL used to make them that way because a lady she worked with shared a recipe with her about 45 years ago. Everything was THE SAME except for the 'garnish' of egg slice and olive on top. How funny! I still love those enchiladas and can almost taste them when I think of them. One of our weird family traditions is no bows on the packages. It started when my daughter was tiny and I just ran out of time and didn't want to make another run to the store. We joked about it but to this day, we don't like to put bows on our family gifts. AND you don't have to worry about them getting squished under the tree! My family doesn't have so much a tradition for Christmas but my late father's birthday was 12/26 and we always stayed over the extra night to be there with him and we always celebrated with a family recipe called Pot Pie. You heard of it? I doubt it because this recipe is not for the chicken-and-potato filled pie you are thinking of but rather an eggless, square noodle thing made from Crisco (yeah, it ain't health food), flour and water. It is all doughy and carb overload and requires salt and pepper but is yummy, Originally it was made from beef broth and beef but my mom amended it for chicken and even did it vegetarian (when I was all vege) and gluten free- looks weird but tastes fine- for my daughter. I've been looking for a good enchilada recipe for years. Thanks. Your enchiladas are very similar to what a I make...showing my age? I love traditions. A fairly new one is my granddaughters take turns on Thanksgiving night spending the night at my home and help to set up the tree. They came up with the idea of taking turns then it would be "their tree". My parents always made perogis on christmas eve for us as kids. Our longest tradition would be spending Christmas Eve together.My siblings and I have spent every Christmas Eve of our lives together. There have been years when some of our children couldn't be with us but my brother and sisters somehow have managed to keep this tradition going. Another tradition is dinner has always centered around tamales. Yum! Thank you for sharing your tradition and the recipe that goes with it! The kids look like they're having a good time! My favorite tradition is spending Christmas Eve with my extended family, eating and laughing and telling stories and reliving some memories from the past. It's the day I look forward to most each year. Thanks for sharing the recipe! one of our family traditions is to invite at least one other family that has no family in the area over for Christmas dinner. My mom is a recipe collector so at that meal there's at least one brand new dish to try. This might be the dish this year! Thanks. First what a beautful family. In mine it is all about Christmas eve. We open our home up starting Christmas eve morning for breakfast,lunch then dinner for anyone who would like to come over and spend good time and food with us. Many of our traditions do involve food.We have warm, delicious homemade cinnamon rolls on Christmas morning after unwrapping gifts! In the month of December we host a gingerbread house party -- it has changed as the kids have grown, but there is a remnant of it. Sweet Pies, Pasties, Applesauce GumDrop cake, and Party Mix are also a few of the goodies that show up every year. Your post has got me thinking -- I better write down these recipes so that my son will have them. Thanks for the nudge, oh yeah! ----Don't forget the recipe for fudge! I have a similar recipe that calls for mashed potatoes in place of the eggs. Pretty unusual too, but Yum. One tradition I started maybe a dozen or so years ago -- I make cranberry cordial for gifts and ourselves. Happy Holidays & A Very Merry Christmas! One of our families "traditions" was that my eldest sister made lots of wonderful sweet treats for our enjoyment as we opened gifts and so we didnt perish before the meal. Her english toffee became "infamous" amongst neighbors, family and friends. She has since passed and I have the recipe card with her hand writing and have become the toffee maker. It took me two seasons to get it right, but I did. I also took over playing Santa (as in the one who hands out the gifts) for her....so traditions carry on, fortunately as does the love that one gave to us! Thanks for sharing your talents, love and fun with all of us! Merry Christmas, girlies! Our traditions are a big hors d'ouvre party at my uncle's on Christmas Eve, then a big tradtional (goose!) dinner at our house on Christmas Day. Your enchiladas look super yummy!! Love the hand written recipe card. I have some from my MIL and mom. Love them. Cherished family recipes. Christmas traditions..we are at a crossroads with that right now..my Mother is getting too old to carry most on, the grandchildren are all adults and going their own ways, I am not sure of my role anymore. Perhaps as my children start their own families new traditions will come to be within our family as a whole. How lovely to see the children all involved in your family tradition. Ours is a simple Christmas Eve ritual and continues even though my children are now 15 and 17 - a plate of mince pies for Father Christmas, 2 carrots for the reindeer and a small glass of sherry/Baileys. All left on the fireplace hearth before trooping up to bed with stockings to lay on their beds, awaiting a visit (hopefully) by FC. I love that they still go along with this ritual, it marks the beginning of Christmas for me. christmas stockings have turned into a new tradition, in past years just a few little doo-daah like most people. Our family has grown so much that buying gifts for each person was not an option. So our stockings are now three and a half feet tall and we just stuff stockings for everyone...fun little goodies that you know they're goin' to love...and homemade gifts have made a huge come back!! :) can't wait to try the enchiladas (i'm half portuguese too!) Happy Holidays!! What priceless pics you have there. I love family traditions. We all get together Christmas eve and have a family chili and dessert cook off and have a hay ride with christmas caroling with the kids. It has always been something we look forward to every year. How wonderful to see children making memories! I'm sure they will have many stories to tell their offspring one day. Loved your story about the enchiladas and all the pics-so cute! We do mock chicken legs with veal and pork cubes on a stick, breaded, lightly fried and then baked! We all watch each other to make sure no one eats more than their share-So Delicious! This looks like a fantastic recipe! My husband is Portuguese only his family is from the 'continent' (said with a portuguese accent). I'm going to make hime these to see if likes them!! Paula, I love that you shared this family tradition with us. 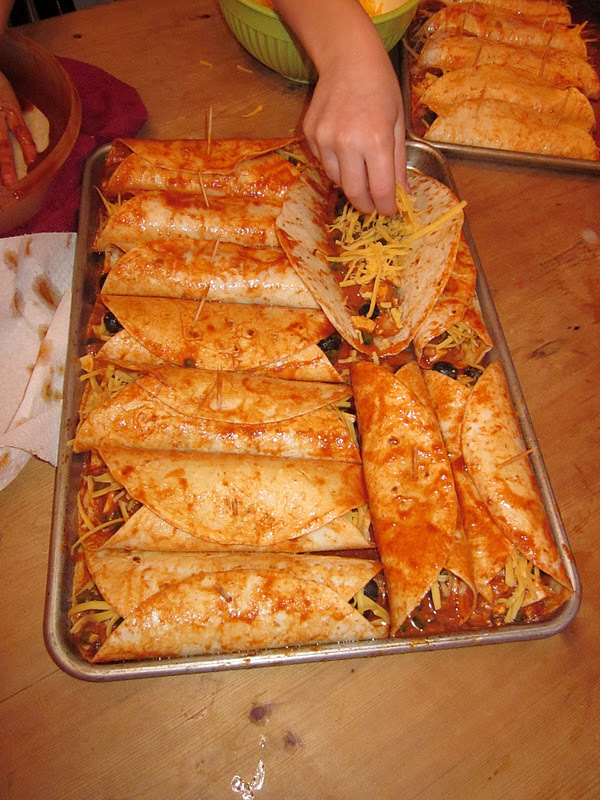 I only wish I were there to share the enchiladas with you...they look delicious! I'm half Polish and one of my favorite memories of my grandmother is her making potato pancakes (not nescessarily at Christmas, but for special occasions). Now, for many years, my husband and I have made it our own tradition to have potato pancakes Christmas Eve. So many of our happy memories do center around food & family, don't they? All my childhood traditions died with my mother in 1986. You can't really fill your own stocking and get the same effect as when your mom did it. My only tradition is that I always bake a ton of cookies and share them with everyone I know. Your enchiladas look delicious! What a nice organized tradition! We have several goodies that we've made in my family where the recipes came from my grandmother. We also have our big candle light dinner Christmas Eve. It's just wonderful being with the family and joining with our family who have gone on through the traditions we have. Thanks for your blog. I love it! Merry Christmas. Traditions are a good thing and seems in today's world some of that is lost but it's never to late to start. The enchilada recipe is great and am definatley going to try them - such a nice thing for you to share with us. Also love the pictures of the great helpers. We have lots of traditions but one is Christmas Cookies. My Danish grandmother always sent them to us when I was little and I continued to make them with my family. We have added to our stash of "have to" recipes with my Mother's stuffed dates being a favorite. I love the enchilada recipe...it looks like some I cherish. Tradition--we open presents from each other on Christmas Eve and then see what Santa brought on Chirstmas morning. One of my favorite Christmas traditions is to sleep by the Christmas tree on Christmas Eve. My daughter started doing it when she was two years old. When her two brothers came along they joined in too. They grab sleeping bags, pillows, favorite stuffed animals, favorite blankies and snuggle up waiting for Santa. They are now 28, 26 and 24 years old and if they come to my house for Christmas, they still snuggle up by the tree and sleep on Christmas Eve. we have adopted my parents tradition of celebrating on Christmas eve. we love getting the family together. We have a tradition in our family of exchanging Christmas ornaments. The day of the exchange always brings oohs, aahs, giggles and lots of inside jokes brought to light! And what fun it is as we unwrap the ornaments each year to decorate the tree and reminisce about when we got each ornament and who gave it to us. An added bonus is that when the kids/grandkids grow up and leave home, they have a box of ornaments for the tree in their new home! Well I wrote a long post about traditions but Blogger lost it, it looks like. So bottom line - we have taken over the family traditions - I now fill stockings for our parents and for their grandkids near by...and I make the family fav butter cookies so we can all decorate them - another tradition. This year we made tinsel trees for the 3 youngest family members rooms - color choices made us laugh but it was their call - pale pink, teal and silver were the picks! I need to make a couple GREEN for my parents house since they don't put up the tree now. I love traditions. Thanks for sharing yours! Since my children were young we opened up our home on Christmas Eve to friends and family who wanted a place to go after the Children's Mass. For 29 years the number of folks who come has increased and we now have over 50 people to come! We have a very small home and it is literally filled to the brim, but everyone one loves spending the evening together. My children, nieces, and nephews constantly tell us that Christmas Eve (along with the sauerkraut balls I make every year for it) is their most treasured tradition. ornament exchange. Some were made and some purchased. Some mailed from various corners of the country and some hand delivered. Numbers were drawn. Santa" and I don't know if it is still in the box or on her tree. the connecting of our lives... Gratitude for the love. Oh my goodness, those enchiladas look delicious! I may have to try those myself. The Christmas tradition that sticks in my head is that none of the gifts go underneath the tree until all of the children are in bed. The "children" are now 19 and 21 and they STILL make me wait to put the gifts out until they are in their rooms! We always open new pajamas and read the Christmas story from Luke and act out the story. Some years only children, some years in a barn, some years we include the adults. We always remember the years where we had arguments over which little niece would be Mary. Those years we had several times through the script for all the Marys to hold the baby Jesus. Such good memories. One of our family traditions involves watching old movies. With this being the last Christmas that my mother will spend with us (brain tumor). I loved that I got to spend last Friday night with her and watch The Bishops Wife and Christmas in Connecticut. It was a very special evening and one that I will never forget. We love watching Christmas movies. When my kids were still at home, my husband would always read A Christmas Carol by Dickens aloud to them. Lots of great traditions being shared. One tradition we have is that each of us has our childhood stocking and use it every year. Mine is the smallest and felt (no stretch) and our son's is the largest and knit (lots of stretch). Enjoyed reading about everyone's traditions. There are 30-40 of us who gather at my Uncle's house on Christmas Eve and do lots of eating, drinking, play games, and open lots of presents. It's always a lot of fun. For the last 40 years, my boyfriend's mother has made santa claus cookies for christmas. they are quite a big deal in their family. She usually makes about 25-30 dozen every holiday season. All of the kids come home and help decorate and trim the tree. It's a good tradition. I love all the inspiration you provide so freely in your blog posts. I know how much time and energy it takes to do it all and am constantly amazed at how prolific you are. Thanks for this giveaway.....I would provide a tradition but it's changed so much with every passing year that I can only tell you what my family is doing this xmas eve. It's something we started last xmas eve and it involves my hubbie and I making super yummy fish tacos with all the fixins (Tecate beer included) for our families annual (tradtional) Christmas eve celebration. Any one who is interested let me know and I'll give you the recipe! We go out at Christmas time with our whole family to the same restaurant we have been going to once a year for 30 years. We have such a blast. Hmmm i would have to say making Polish Stuffing. One of our traditions involves the cutting down of the tree. My brother has a farm and we always cut our own tree we find in the woods. Sometimes it's a little bare in places and almost always too tall but the hunt for the perfect tree is always fun. We all take turns with the axe chopping it down. Smells wonderful! The enchiladas looks great! We always have tamales on Christmas Eve, though we don't make them ourselves. How funny...we always have stuffed shells for Christmas Eve dinner.Thanks for the giveaway chance! Well I guess depends on who you are...enchiladas always happen during Christmas at our house, and lasagna too. I love that we set our own tradition of going to the mountains for Christmas...sometimes we even have our white Christmas. Foods do play a big part in our holiday traditions. For about the last 6 years we've had a white popcorn birthday cake for Jesus, before that it was usually a fruitcake. I love hearing about others' family traditions. They're what the kids remember. Ours love our silly little traditions. I grew up with a Norwegian treat every Christmas, Lefsa, that my mother would make. Now that she's gone, I so wish I had paid attention and learned how to make it! I'm starting a tradition with my 3 an 4 y.o. grandchildren this year....Gingerbread Houses! Now that the "kids" are all adults and we live all over the country...we always try to get together for at least one night during the holidays. We spend the evening eating quick foods and playing games all night in our pj's. Everyone spend the night and we have breakfast together before everyone has to head on out. I love Christmas and all the magic it brings with it. I think it is so fun to share the traditions I grew up with, with my children. they love making sugar and gingerbread cookies. I love the Traditions series, thank you! I'm in Australia now so my christmas traditions have changed a bit but my childhood xmas memories are basically associated to New Years Eve. We (the whole family) used to reunite for this special eve and have a big meal together. Then, we listened to the bells at 12midnight while eating the 12 grapes at the same time as each bell's dong (spanish tradition). Once this was finished, we greeted each other the New Year and rushed to the Christmas tree. Under it, everyone had a present (or more if you were a kid) with his/her name on it. What a great way to start the New Year, family, happiness and special gifts! My favorite tradition is one from my childhood. Every year on the day after Thanksgiving, my mom would put up the tree and we all decorated it and the entire house. The next two days of the long weekend were spent decorating the outside of the house. I always loved pulling out those ornaments and remembering why we had this one, or how long we had had that one. Our tradition is "Family Nap Time" after the sugar rush and present crazies. And the kids are grown! one of my favorite memories was hanging out in the kitchen with my dad pouring over the cookbooks looking for new stuff to try, then we would make it. the other is when we would go to the christmas tree farm to cut down our christmas tree and if we were lucky there was a big snowfall before and we had awesome snowball fights! 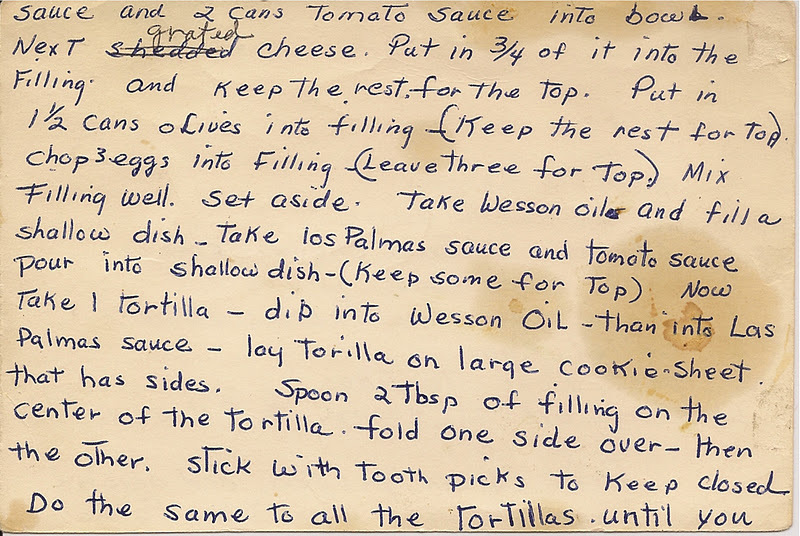 I love that you have a hand written copy of your mom's recipe. What a treasure. The memories you made with your "helpers" while making the enchiladas will be with them forever. Going to church Christmas Eve for a caroling service, the traditional ethnic food at both my husbands' family home and mine, special ornaments to be hung and decorations to be put out, the afternoon family walk outside no matter the weather, the reading of the Christmas story before the meal, washing all the dishes by hand before gift opening at my Grandma's (she never had so many willing helpers!) - they all add up to one thing. Family time together on a special day. Joy, peace and love. Loved seeing your mom’s actual card, so cool. We have a tradition where we make tamale’s on New Year’s Day, reminds me a lot of your pictures with all the stations. Fun times spent together making memories. Thanks for sharing your stories. Thank you for sharing your Mom's receipe..so great that you have the original.. I love this time of the year...so many memories,old and new. I am now a mother of 2 little girls. Starting family traditions is very important for me. I want my little girls to have the best memories of growing up. We love to make make cookies during the holidays. Omgosh!! That looks delicious! Can I join you guys for dinner? I, coming from an Asian family, don't celebrate Xmas at home, but more with friends. I love your blog it's one of my favorites!!! 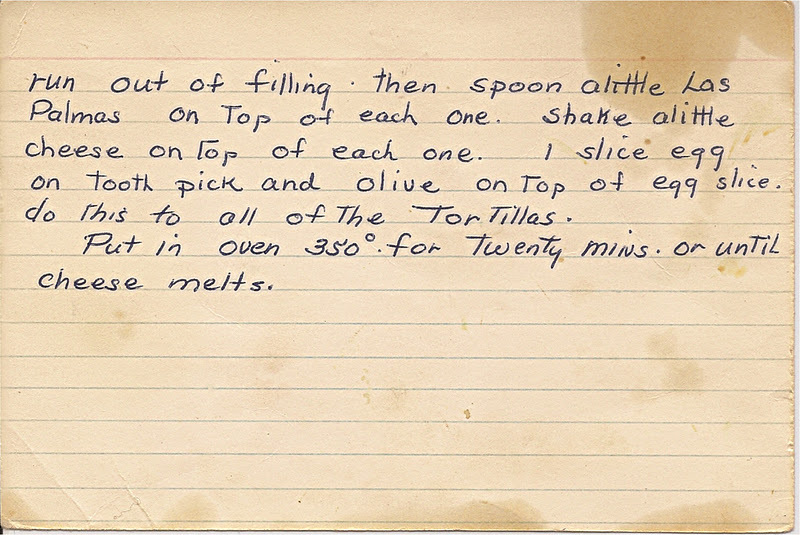 I have my Paternal Grandmother's recipe for Nana Sara's Sour Cream Coffee Cake in her handwriting. It's stained from many years of love. She wrote little notes in the margins, like "flour" the pan with dry cake mix and it won't taste like flour. Christmas isn't complete until it's made. And I make it on the 23rd, because it's better after it's sat for 2 days. I always feel her presence when I'm making it. Oh, and you *might* want to make an extra pan of enchiladas. I'm thinking I'm coming to your house to join you! With Nana's cake of course! Loved hearing about your tradition! Great photos and I love that you share the original recipe cards! Great stuff! We have lots of little traditions like making a gingerbread house each Christmas! Found you via pinterest - glad I did! The copy of your mom's handwritten recipe struck a cord with me. My most cherished possession is my Mom's chocolate chip cookie recipe written in her handwriting and the yellow pyrex bowl that she gave me when I turned 21. Mom died at the young age of 58 in 1992, so I cherish this connection with her. When I make cookies for my kids, I can feel my mom's loving presence. One of my family's traditions was my mother's nut bread. SInce she died 10 years ago, I now make it for everyone at Christmas...it just says CHRISTMAS to me every year. We have one long ago tradition - my Grandmother's Scotch Shortbread and a newer one - Puddin Head Gingerbread Men. Everyone enjoys the gingerbread one because we all have the fun of decorating them. It's like never growing up. I will try Paula's recipe and love it that we have the original recipe card. Happy holiday's to all! 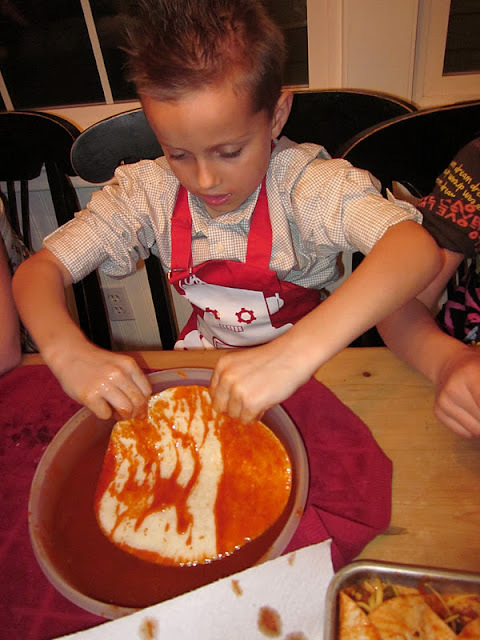 I love the photos of each step of the enchilada process! These will be the memories everyone cherishes. Those enchiladas look delicious. I can't wait to try your recipe. The recipe looks delicious. Thanks for sharing. traditions keep our stories alive. At every holiday dinner my grandmother put sweet pickles and cottage cheese in a divided glass dish...no one ever ate the pickles or cottage cheese but if they weren't on the table we couldn't begin the meal... I have the divided glass dish now and it graces each holiday meal. Every year my husband and I go for a walk around our little town on Christmas Eve. It's always very special if it's snowing! My favorite Christmas past memory was the day we made Christmas cookies with my mom and, when she was still with us, my Gammy. We always begged to be the one to operate the cookie press. We would bombard all the cookies with sprinkles and that colored sugar that looks like glitter! Thanks for sharing your Christmas traditions. 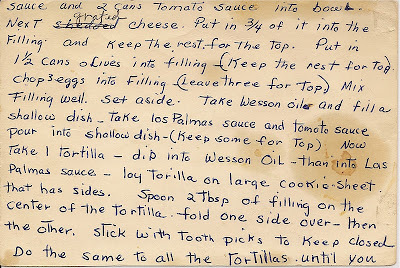 Recipes in the handwriting of the cook are the BEST! Such a wonderful keepsake. That is the sweetest scene! We do not really have any real traditions in our family. I remember from my childhood the lights and music of the Parthenon replicated in Nashville, Tennessee. Nashville is the sister city of Athens and why we have our own Parthenon. Every year my family would pile into the station wagon and head out to see the Christmas lights in town. We would end at the Parthenon with a huge nativity with changing pastel lights and wonderful music. No animation but exciting all the same. On the way home we would take the route by the living nativity at our church. I always wondered why the character did not shiver like me. A minor miracle, I guess. There is nothing better than enchiladas with Las Palmas sauce! I came in too late to win a prize, but I feel like I won one, because of this recipe! The photos of everyone making the enchiladas was adorable! It warmed my heart to see these kids making memories! Thanks so much! Love seeing the family all working together but I do have one question..... Whats with the slice of egg????? ?